Are blue states or red states better for business? Where would you locate the headquarters (HQ) of your company? Are businesses in Democratic vs. Republican-leaning states more sustainable? More responsible? More ethical & transparent? What do the numbers tell us? Kyle Potvin (JD/MPP, UMass Dartmouth, 2013) and Amie Tailor (MBA, UMass Dartmouth, 2013) just finished checking and sorting the HQs of the 1,686 U.S. companies in CSRHub’s database (the world’s largest collection of ratings and information related to corporate responsibility – including 93% of the Fortune 1000 and more than 95% of the S&P 500) among states (ranging from ultra-blue to ultra-red, depending on the number and margin of victories of Democratic vs. Republican nominees in the past four presidential election cycles). Results & possible interpretations below. Clarification: this is NOT intended to be partisan – Kyle & Amie chose this project and my intent is to post a surprising observation to provoke further thought & conversation, not to advocate for a candidate or party. 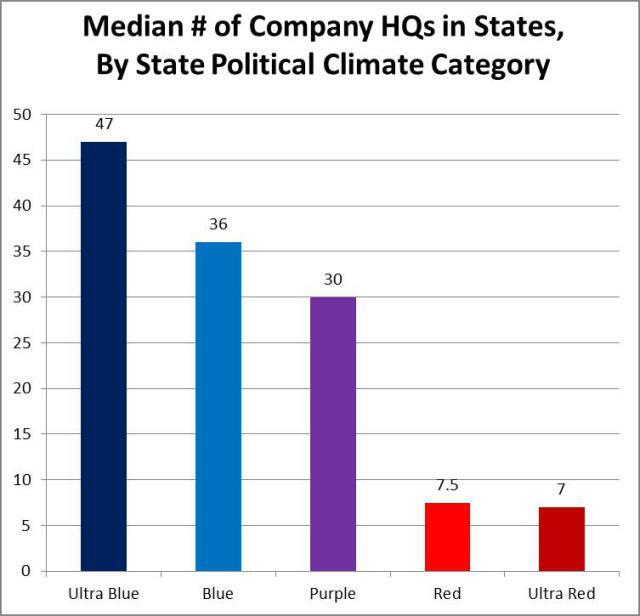 (1) By a margin of about 7:1, companies favor having their HQ in Ultra-blue v. Ultra-red states. Median # of company HQs per state variety (states by category are listed at the bottom of this post): Ultra-blue 47, Blue 36, Purple 30, Red 7.5, Ultra-red 7. Top 5 Blue State HQ Locations: CA (252 company HQs), NY (159), IL (101), PA (84), MA (73). 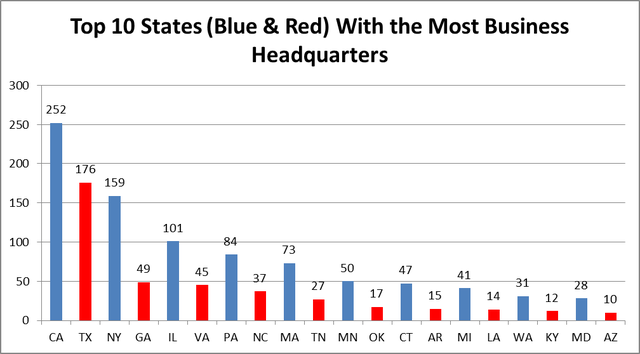 Top 5 Red State HQ Locations: TX (176 company HQs), GA (49), VA (45), NC (37), TN (27). Next 5 Top Blue State HQ Locations: MN (50), CT (47), MI (41), WA (31), MD (28). 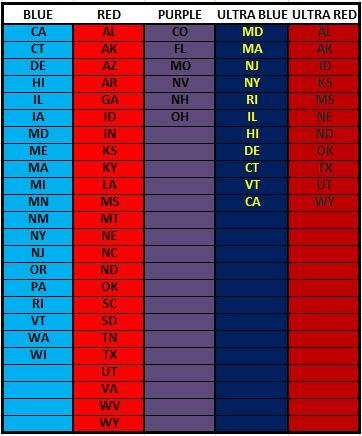 Next 5 Top Red State HQ Locations: OK (17), AR (15), LA (14), KY (12), AZ (10). (1) Since the sample includes 93% of the Fortune 1000 and more than 95% of the S&P 500, one could interpret these patterns to simply mean that, by a large margin, U.S. companies perceive the best locations for running a business to be in bluer states. As none other than Jack Welch (former GE CEO and University of Massachusetts alumnus) said during a visit to our campus in 2005, he’d favor locating a business where there’s an educated workforce and good transportation infrastructure. Public investments in education and infrastructure tend to be favored more in blue vs. red states, so this “election result” shouldn’t surprise us. (4) Presuming further that we can also test and discover that there is a connection between being transparent and/or reporting and actually being more responsible, we may see a headline that “Companies That Are More Responsible Tend to Locate HQs in Blue States.” On a somewhat related note, Co-Founder and CEO of CSRHub Bahar Gidwani recently published an analysis of whether better performing companies tend to be located in more sustainable cities. Regardless of which interpretation(s) one favors, the raw numbers above should provoke some substantive debate about which political, cultural, regulatory, and tax climates really are “pro-business” – it would seem that the answer is contrary to a lot of unquestioned assumptions. Associate Professor of Business Law and Sustainable Development at UMass Dartmouth, specializing in research and teaching on sustainable business, corporate social responsibility (CSR), sustainability reporting, integrated reporting, and corporate and environmental law.